You can't skele-run from these skele-puns. Halloween is my favorite holiday. Who doesn't love a holiday celebrating gluttony with such a focus on treats? Halloween music is perfect for the spooky season and is acceptable to listen to all year-round. I appreciate it most because it's the one day a year where everyone lets their inhibitions go and goes crazy. Everyone is free to be creative and express themselves. As college students, holidays can be fun but also stressful. The great thing about Halloween is that it's a voluntary holiday, so anyone who doesn't want to participate doesn't have to. No worries if you would rather spend the night in studying than going out and celebrating. There is no gift giving, so you don't have to stress about what to get someone for Halloween or worry about budgeting. The only stressful thing about Halloween is having a costume. As college students, it can be hard to dedicate time and money to buying or making a costume. It can also be hard to be creative and find inspiration. I like to make people laugh, so some of my favorite costumes have been based on memes, inside jokes, and puns. I wanted to share some of my favorite puns that can serve as great inspiration for quick, cheap, and easy Halloween costumes. Some of them may be corny, but they will lift your spirits and make your friends laugh until they're coffin. Show that you're sweet but also psycho by carrying around or dressing as your favorite sugary cereal. You can make this as dark as you want, by dressing as a murderer or simply having a plastic knife stabbed into a cereal box. It's also pretty killer that you'll have a box of cereal around for a snack! Sorry girls, this one's for the boys. If you're a boy and a fan of computers or even used to be an altar boy yourself then this pun is for you. It's super simple to make yourself, you can just print out images of the "Alt" and "R" keys to tape to your shirt. Don general fan gear and bring some pep with signs! Show why you like ceilings. Don't have general fan gear? Then sport your favorite team's gear and show your knowledge of football by going as fantasy football. To make it a fantasy, you can add magical elements like wings and a wand. You can make even make it a couple costume like these two! Whether or not you're at crossroads in your life, this metaphor will be a hit and will show you're on the right path with this costume. Simply wear a black shirt and put yellow lines dotted lines of tape down the center and a plastic fork on top. Or you can buy a t-shirt from Amazon for $16.99. Life got you down? Do you like chips? Then this simple costume is for you! Just wear normal clothes and attach a chip to your shoulder. 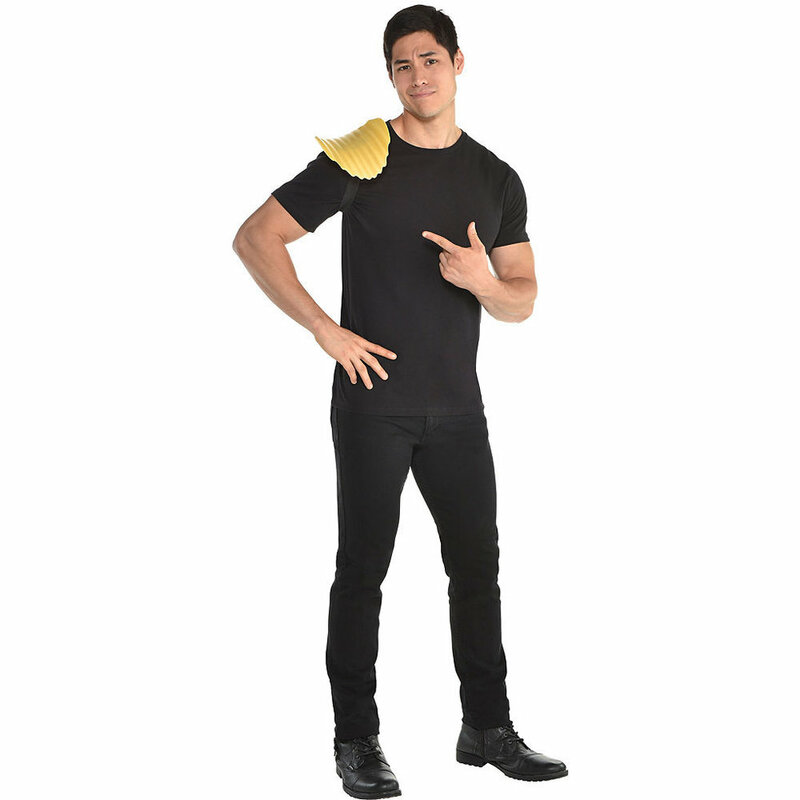 While you could use this prop from Party City for $6.99, you could also just attach a single chip to your shoulder and carry around a bag of your favorite chips. Plus you'll have a snack for later! Are you a party animal? Show your party spirit animal by donning your best attire and wearing animal-themed accessories. If you're super creative, you can do your own makeup to make yourself look like an animal. Are you one of those millenials that would rather buy avocado toast than buy a house? Then show how much you revere avocados by going as the expression 'Holy Guacamole.' Find your green clothes and other avocado paraphernalia you naturally have as an avocado devotee. Tape images of avocados to yourself and make yourself look as holy and angelic as possible with a halo and wings. Along with Holy Guacamole, you could be a holy cow. Still a pretty simple costume with cowprint clothes and angelic accessories like a halo and wings. If you're competitive, this costume is super funny and shows your winning spirit. All you'll need is your workout clothes, a bag of bread, and those old medals you got for participating in sports in childhood. Sorry boys, this one's for the girls. Show off your girl power and spiciness by going as a group of different spices known as the 'Spice Girls.' With so many spices out there, your options are endless and you can include as many friends as you want. You can take inspiration from many different spice brands, but McCormick may be the most recognizable if you wear a red shirt and print out one of their spice labels. Show off your hip-hop style and awesome rap skills by wearing your favorite sweat suit and attaching candy wrappers to your outfit. A new take on the old Humpty Dumpty, show your devilish side and your love for eggs. You'll just need a white shirt or tape a white paper with a yellow circle on your stomach and devil horns. And "This is How You Remind Me" of the meme that is Nickelback. Even if you're not a fan of the band, this meme will never die and you'll get plenty of people singing to you all night long. Just tape some nickels to the back of your shirt and you're ready! Don't forget to take a "Photograph"! If you want an excuse to wear your pajamas, then consider going as a pig in a blanket by wearing your pajamas, a pig nose and ears, and wrap yourself in a blanket to stay cozy! If you and your "Team" will never be "Royals," then consider dressing like Lord and wear your ring collection to make this nerdy pun. Lorde's style is perfect for all those ladies whose closet is filled with black clothes whether or not it's Halloween. Are you a positive person? Then this costume is a great way to show your positivity by happily dressing as Life and handing out lemons. All you'll need is a shirt with Life written on it (or on a paper taped to your shirt) and some lemons. They say that sometimes blessings come in disguises, so put on your best disguise (maybe a glasses with fake nose combo?) and remind people that you are a blessing by having a shirt with 'Blessing' written on it (or again you could tape a paper to your shirt). So creep it real and have a gourd time on Halloween!